Association for Learning Technology (ALT) certification scheme – slightly bonkers in one respect! last week I finally got my ALT certified member scheme. The process of gaining certification proved useful to me as it forced me to reflect on my work over the past 8 years in the field of learning technology. I reflect on the application process below, but this is the bonkers bit. For some reason the certificate states “This certificate remains valid for 5 years from its date of issue”. This is mad. In 5 years time I am unlikely to have unlearned what I know today. When I gained a degree qualification 20 years ago, there was no requirement to put myself through an assessment process ever 5 years to prove that I am still worthy of that qualification! Granted, professions such as doctors have to demonstrate that they keep currency with developments through ongoing assessment. However, I hardly think that the two compare and wonder what thoughts ALT had when they decided on this course of action? Applicants like myself are not necessarily an easy fit with the scheme, as my work focus has been more towards programme development using learning technology rather than the work that a learning technologist might undertake. This lead to some issues with assessment in particular the section on “Wider Context: Legislation, policies and standards” which I failed first time round! I think that issues are arising because in order to be a viable scheme, ALT need to embrace a wider community and this will naturally challenge assessors view of what it means to be a certified member of ALT. 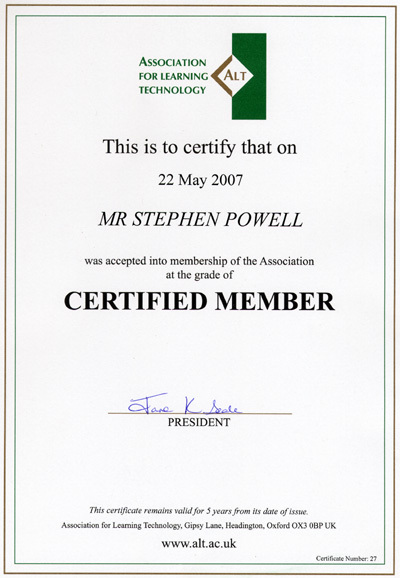 This entry was posted in Learning thoughts on June 3, 2007 by Stephen Powell. Â£52 per annum (Â£25 for students, retired, unemployed; Â£65 overseas). This is a new scheme, and we are have yet to decide on the renewal frequency. What we are sure of is that renewals will be judged on a much lighter touch basis than initial applications, essentially to ensure that the holder is still practising and developing as a learning technologist. A blog may not be the best place to discuss this, but certainly your post above, and any other views you let us have, will be on the table when we are deciding on the renewal process and frequency. Thanks for the information Seb, good to read that CMALT will be both responsive and inclusive of its members views. Congratulations Stephen. Just making ccontact again after a long lapse. We are now in our house in Buffelspoort, SA with plenty of guest accommodation! Hi Gill, good to hear from you and glad you have settled in! I don’t have an up-to-date email address for you. If you read this please send me an email to stephen.powell@core-ed.net. Congratulations – and thanks for the info on the five-year plan. I think I’ll stick to being an expert without the bits of paper!